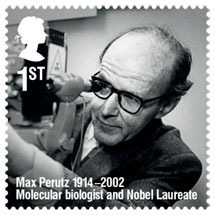 The founder of the LMB, Max Perutz, has been honoured on a Royal Mail stamp, as part of their ‘Remarkable Lives’ series. Max is one of 10 distinguished people honoured in the series, which commemorates significant people on the centenary of their birth. The stamps feature monochrome portraits of the subjects; the image of Max shows him with a diffractometer, in a photograph taken by Cambridge Newspapers in 1980. Max Perutz was born in Vienna on 19 May 1914. After studying chemistry at the University of Vienna, he arrived at the Cavendish Laboratory in Cambridge in 1936, to work in the field of X-ray crystallography. This move would lead to him becoming a pioneer in the new field of molecular biology, co-founding a world-class research laboratory and developing a technique to unlock the structure of proteins. This technique, protein crystallography, has been used worldwide to determine the structure of large biological molecules. Max used this technique to unlock the structure of haemoglobin, the protein in blood whose major function is the transport of oxygen from the lungs to the tissues. Throughout his career Max received numerous honours, including the 1962 Nobel Prize for Chemistry, jointly with fellow LMB researcher John Kendrew, for their studies of the structures of globular proteins. Max was made a Fellow of The Royal Society in 1954, Commander of the British Empire in 1962 and Order of Merit in 1988. Max played a key role in the history of the LMB. He was Director of the ‘MRC Unit for Research on the Molecular Structure of Biological Systems’ when it was established in 1947; and when the unit became the MRC Laboratory of Molecular Biology (LMB) in 1962, he became its first Chairman. Max officially retired as Chairman in 1979, having overseen the development of the MRC unit into a first class research laboratory. However, he continued with his research, in later years studying Huntington’s disease, until shortly before his death in Cambridge on 6 February 2002, aged 87. The inclusion of Max in the ‘Remarkable Lives’ stamp series for 2014 is particularly apt, as 2014 is the UNESCO International Year of Crystallography. The ‘Remarkable Lives’ stamps are available in various formats from 25 March 2014.